Are Double Stuf Oreos really double stuffed? Some disagreement here: Chris Danielson in part 1 2 and 3 versus Chris Lusto in part 1 and 2. 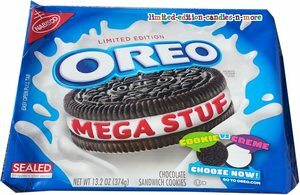 Enter in the Mega Stuf Oreo. Is the Mega Stuf double stuffed, triple stuffed, more???? And who was correct, Chris or Chris? I’ll leave the math to you. Or if you’re terrifically lazy, spoilers found here. Edit (8/18/2013): This post is now featured on the Huffington Post. Should have used better handwriting! I am really hurt that yall took back the mega stuff Oreos.I really love those cookies bring them back please. Yeah that should have been a hint. Funny thing is I always suspected this but didn’t really care. I mean, a cream filled cookie is a cream filled cookie, whether or not I’m mislead as to how much cream is in it. I would be interested to know what the variation of stuf each cookie type is. 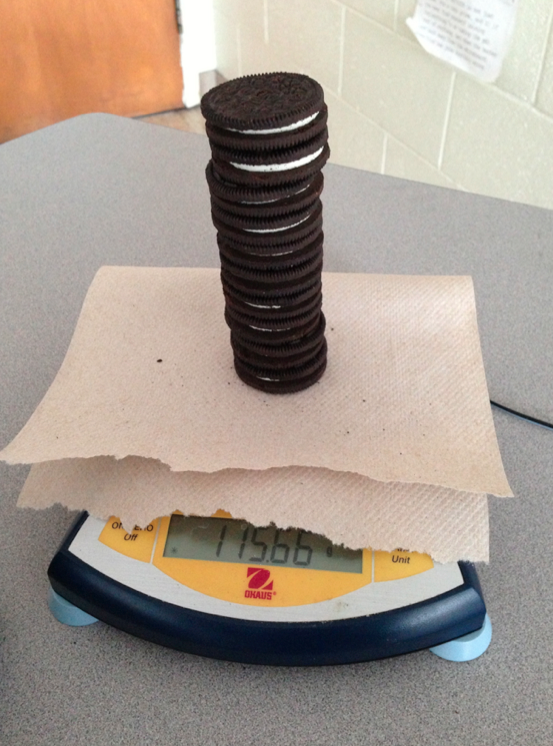 The problem with this experiment is that it appears you only used one type of wafer to determine the wafer weights. If you look at an original wafer compared to a double stuf wafer, the design is different. The double stuf wafers may weight less than the original wafers which would account for the difference in calculated weight of the stuffing. Some more tests may be in order…. This is a very good observation. More tests will need to be performed. First, you should have measured the “stuff” between the cookies to see if there indeed was 2X the “stuff” not confuse the issue with the cookies as well. Of course there will not be 2X when you also did not double the cookies as well even if there was indeed 2X the “stuff”. Second, you really annoy me in that the students are massing not weighing the cookies. How will they ever learn the difference if you do not teach them the difference. I was not massing the cookies, there was no balance. 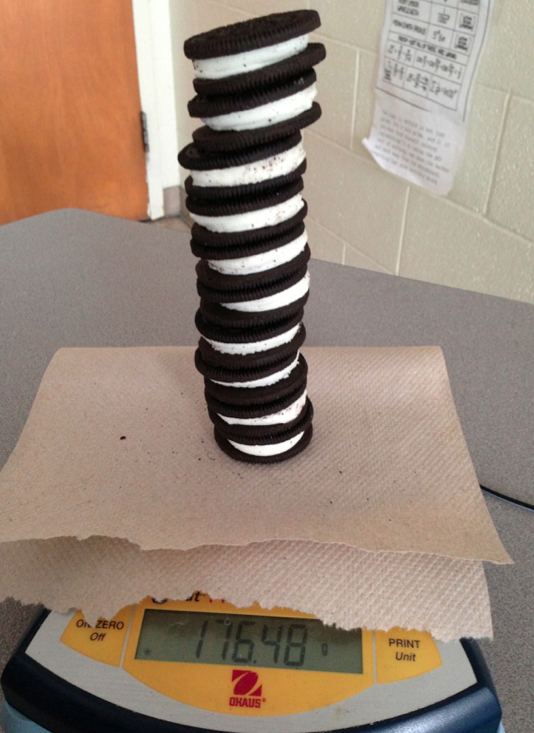 The students used a scale, so … it was weighing. Good one Dan. U know you stuff and not ‘stuf’. 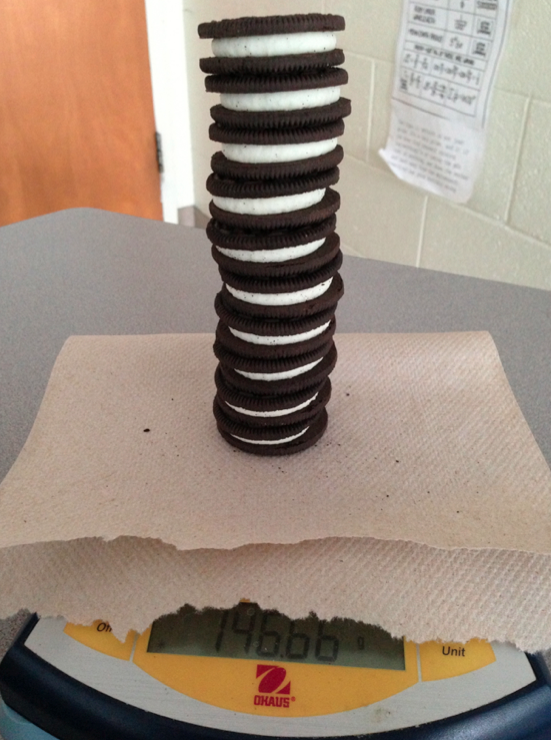 And here I was thinking it was a beautiful thing that the cookies were included… Students have to determine if this is a directly proportional relationship or not. Factoring in the y-intercept of the cookies before analyzing the rate of change is awesome! The task will help identify student misconceptions in linear relationships. Dan, just so you know, you need to remove the two cookie halves from your equation. If you do this you will find you will come up with a 2:1 ratio. Now go apologize to your students. “The Man” is ripping us off with other products as well!!!!!! After the 2008 recession, many company’s reduced the volume of their product on the store shelves such as crackers, juices, jellies but the keeping the same sized outer container, reducing volume on the inside AND kept the price the same. They were sneaky in how they did it, keeping the size of the box the same but reducing the size of the bag of crackers or cereal on the inside, increasing the size of the bubble hidden at the bottom the bottle, making the bottle or jar skinnier but same height thus reducing the ounces of juice or drink. By reducing the amount of product but keeping price the same, actually increases their profit margin and costing you more by the ounce. “The Man” decided that wasn’t good enough so they took it to another level of shafting the consumers. The companies decided, while reducing the volume of the product, they reduced the price also, but by not as much as they should, which actually can increase the cost per ounce of certain items even more!!! I see a CLASS ACTION LAWSUIT on the horizon. Surely some bottom-feeding lawyer will seize upon Nabisco’s “deceptive advertising practice” and gather unto himself several millions of class action clients on whose behalf he will sue, alleging that they have somehow been injured by this callous deception. Any reasonable cookie consumer would conclude that something labeled “double stuff” would contain precisely twice the amount of “stuff” that comes with the original, unmodified Oreo cookie, not a mere 1.86 times that amount. He will righteously represent these offended millions, with the objective of winning for each of them some trivial monetary award, while reserving for himself and his firm a six- or seven-digit fee for the legal services entailed in correcting this monumental injustice! You are right Bighoss. Not worth the time of a lawsuit for a single package of cookies. Unless you show up to fill up your 1 gallon gas container to fill your lawnmower and see that the one 1 gallon that the gas pump says you pumped at your corner gas station does not equal the .86 gallons of gas in your partially fillied up 1 gallon gas container. At say, $3.50 a gallon (perhaps the the cost of a Double Stuf pack of cookies) x that by 20 times you mow your grass a year x 10 years you live near that corner gas station= approx $122.5. Now times that by a 1/3 of a population, say 1/3 (approx 100M people) of the U.S. that buys a gallon of gas from your corner store (hence Nabisco). That’s $12,250,000,000 that “the Man” made by shorting the people on product. We are not talking standard deviation of .99994 gallons or 1.00002. Reasonable numbers like that are typical when trying to be humanly precise in providing what the packaging says and is usually ok by industry regulations. Its when the consumers are being ripped off beyond standard deviation, “skimming” the product. sorry, i meant to say *25 times a year to mow grass, I live in Texas! Plankis, B.J., Vowell, J.E., & Ramsey, J.M. (2011). Oreo and doughnut investigations: investigating food claims. Science Scope, 35(1), 38-41. Why don’t you credit the original publication? Pingback: dustbury.com » Do you need that much Stuf? I did a similar “lab” for years in my AP Statistics classes. I read the coverage of your finidings, and immediately thought of physicist David Neevel’s Oreo Cream Removing Machine. Perhaps a collaboration might be in order for a followup study on the adverse effects of disassembling Oreos, as mentioned in the National Post. Pingback: Oreo fillings don’t add up | Uni-za.com site for your Life. 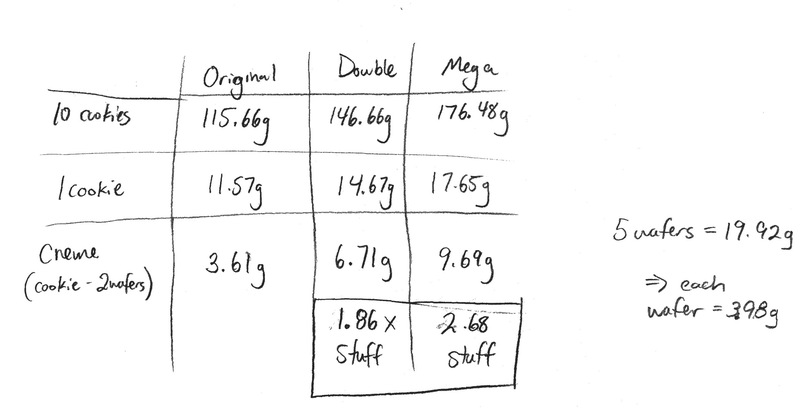 “Double stuffed” are actually 1.86-stuffed, and “Mega stuffed” are 2.69-stuffed. did oreos make their cookies addictive deliberately? if so then i won’t eat them anymore and neither with my wife, they are the most addictive cookies we’ve ever eaten and with most fat and calories. Actually, the wafers of double stuf oreos are slightly bigger (Compare them, you can see the difference) than that of normal oreos. My High School Chemistry class (and our IB class!) 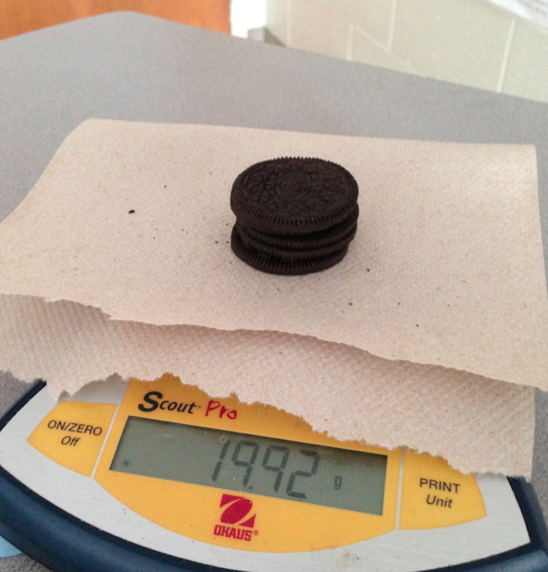 has done this experiment twice, and each time the majority of the class has found that double stuf oreos actually have MORE than twice the amount of cream that an original oreo does. My name links to the mini-write up I did today. Sample size of 3 oreos? Could that be a problem? Pingback: 17 Shocking Food Facts That Will Make You Question Everything - zdouf!